For Christmas I received this book from my parents and now it has come to an end. As many of you know I am a long time Weller friend. This book has been debated on email lists, PW forums and if you have a friend you might have discuss the book with him or her. The book came out after a fall out between Weller and Hewitt and many fans think that this is something between the two and what happened between them should stay between them. The book use their long friendship as a ground to walk all through Wellers career from The Jam until his solo albums. I must say that I find the book very interesting. This is Hewitt truth or his way to look at Weller. For me that not have English as my native language it gives me a look into the songs that for me only have been words before. I’m not that interested in lyrics and most of the time the voice is just an instrument and the words doesn’t mean a thing for me and that is in Swedish, so the meaning of words in English is just – words. 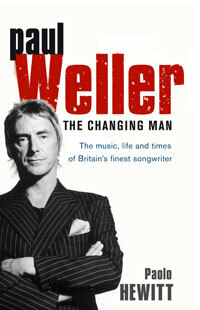 The book use songs from Weller career and discuss the meaning of the songs and put them in a context with Weller. I find the book interesting, easy to read and put Hewitt’s view on Weller into perspective. The book has not changed anything consider my feelings for Weller. As long as he produce music that I like I will buy his records. I like books that just not tell the story from an overview, books that look deeper into the lives and what makes them who they are. Still, the person that now the real truth is Mr Weller himself. And maybe someday we will be able to read his views on his songs and what made him the person he is.